B - It's tempting to damn Kung Fu Panda with faint praise. In some respects, it's a fairly middling film in the pantheon of animated children's fare. However, Panda is blissfully uncorrupted by the pervasive sins of recent kiddie cinema. It's a completely linear and uncluttered approach to the genre that even adults—parents and non-parents alike—will likely appreciate. In place of pandering, pop culture references, and potty humor, Panda focuses its energy on sparkling visual design, engaging characters, and, since this is twenty-first century computer animation, eye popping action set pieces. I can forgive its creaky, shallow message, and even its shrink-wrapped Daoist-Buddhist pearls of wisdom, for one simple, delightful reason: It's an utterly pleasurable bit of digital escapism, executed with martial arts precision. Oh, and it's about a panda who knows kung fu. And he wears little shorts. If I have to explain why this is appealing, there's no hope for you. Po (Jack Black) is a rotund panda—Are there svelte pandas?—who works in his father's noodle shop in a rural Chinese village. Po's dad, Ping (the great James Hong,) is singularly devoted to his gastronomic trade. Ping is also a goose, which raises a zoological problem that the film acknowledges but never resolves. ("Sometimes I think I'm not your son," Po mumbles.) Po is less than enthusiastic about a future in noodle-peddling. His obsession is kung fu, and in particular the exploits of the Furious Five, a band of fearless warriors who dwell in the Jade Temple high above the village. He even has their action figures! Po is, in short, a fanboy. The masters of the Jade Temple are a venerable tortoise named Oogway (Randall Duk Kim), and his old student, Shifu (Dustin Hoffman), who now trains the Furious Five: Tigress (Angelina Jolie), Mantis (Seth Rogan), Crane (David Cross), Viper (Lucy Liu), and Monkey (Jackie Chan). Oogway informs Shifu that the time has come to choose the Dragon Warrior, a legendary kung fu master who will defend the village and temple. Oogway has had a vision that the evil kung fu warrior Tai Lung (Ian McShane) will escape from prison, and the Dragon Warrior must be granted the power of the temple's Dragon Scroll to defeat him. Tai Lung is, naturally, Shifu's adopted son and former student, and upon hearing the prophecy the alarmed master sends a messenger to request a doubling of the prison guards. It's fairly obvious where this is going, even if you haven't seen the trailers. During a ceremony, Oogway accidentally selects Po, rather than one of the Furious Five, as the Dragon Warrior. Of course, Oogway keeps reminding Shifu, there are no accidents. Meanwhile, despite Shifu's warning, Tai Lung escapes from prison in one of the film's most breathless, marvelous sequences, and then sets off for the Jade Temple. For better or worse, Po is the village's champion, and Shifu must find a way to forge him into a warrior. Panda's performances fulfill that irritating, interminable Hollywood animation requirement of being vaguely recognizable without being colorful. The success of the film's characters lies much more with the artists than the actors. That said, the performances are serviceable and not distracting, and that's about the bare minimum I ask of an animated film. Jack Black in particular tones down his sweaty, manic edge to good effect. Normally, Black has a reckless, goofy comic style that misfires (King Kong) as often as it succeeds (School of Rock). Here, he just delivers Po with the requisite pathos and gentle humor, and without shtick. In a wonderful, traditionally animated introductory sequence, he even has a vehicle to show off the triumphant, adolescent muscles that he flexes in Tenacious D.
There's a bit of mean-spiritedness in the film's treatment of Po's girth. When Shifu discovers that the secret to training his corpulent student is through his stomach, it's played for laughs (and cleverly so, thanks to the animators). Yet I can't help but wonder whether treating an obese character as a freak who never "legitimately" learns kung fu—and can always safely be mocked, even after his victories—is the best message for younger viewers. 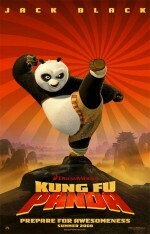 That aside, Kung Fu Panda is the best children's film I've seen this year, and worthy of an adult's time as well. More than a treat for the eyes, it's exciting and endearing without falling into the crass cultural sewers where most kiddie fare wallows. In the age of Alvin and the Chipmunks, that counts for a lot.